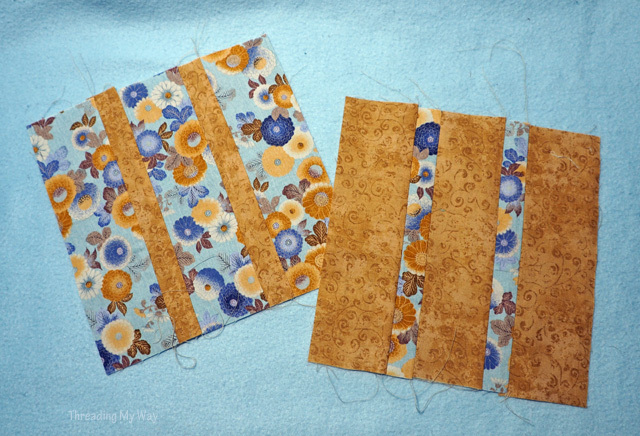 Early last month I showed you 20 quilt blocks made using fat quarters, left over jelly roll strips and a few scraps. I've since made another 40 blocks. This really is a super quick block to whip up. 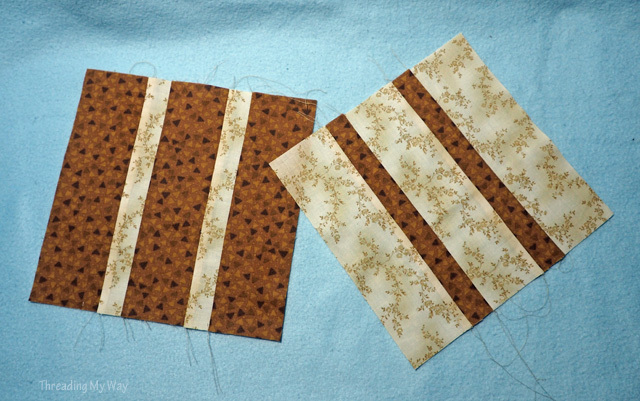 The most time consuming part is choosing the fabrics, then the cutting. 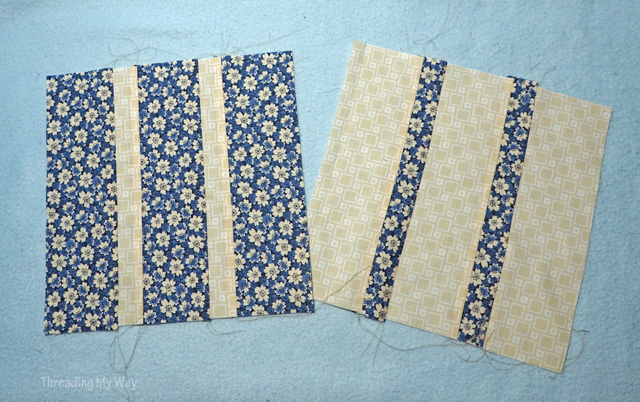 Even so, including the choosing of and cutting the fabric, it only took two evenings to sew all 40 blocks - and I'm not quick at sewing. 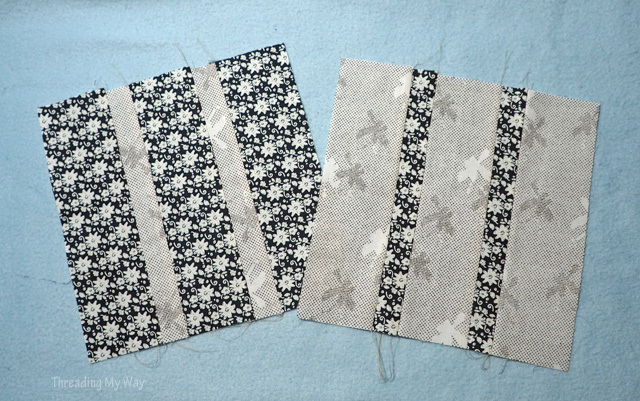 The original 20 blocks have been sent off to Margie (Nanny Craft 4U), at Nanny + Friends Charity Sew. 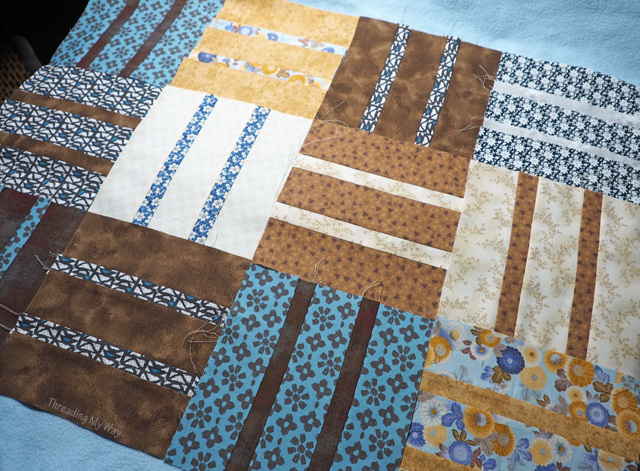 Combined with blocks from others, some have already been made into a quilt top. 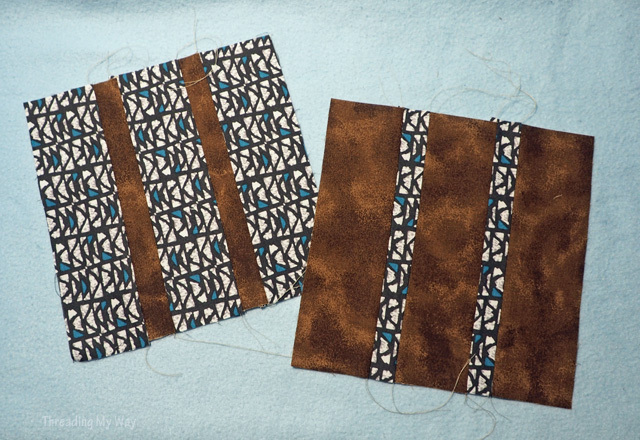 Margie separated the blocks I had made with blue/ brown/ beige colours and posted the photo above to the Nanny + Friends Charity Sew Facebook page. It seems that no one else has yet donated blocks in these colours, and more were needed. 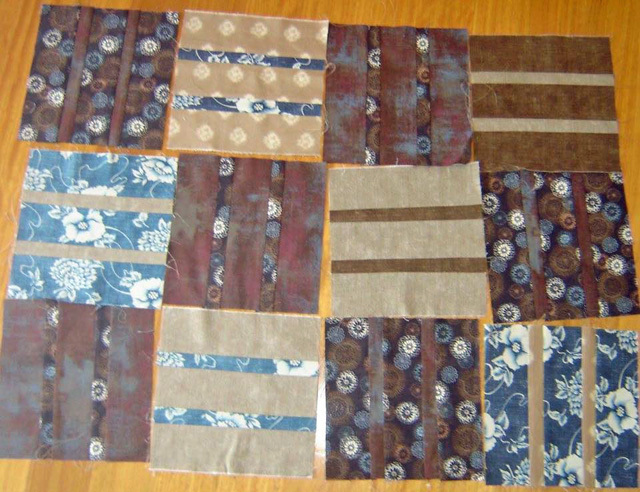 After I rummaging through my fat quarter stash, I came up with the following blue/ brown/ beige blocks. There are multiples of each, adding up to a total of 40 blocks. Thing is, I'm not sure they'll all work well together in the one quilt. There are so many variations, of the blue colours in particular. As well as that, I've introduced an off white, instead of beige. I only had a play with a few of the blocks - see top photo. I'd need to spread them all out to know. Oh, to be one of those lucky people who can visualise colours together. However, I have no doubts Margie will put them to good use, whether in one quilt, or in different quilts. As stand alone blocks, some appeal to me more than others. I particularly like A, E & F. Which ones are your favourites? 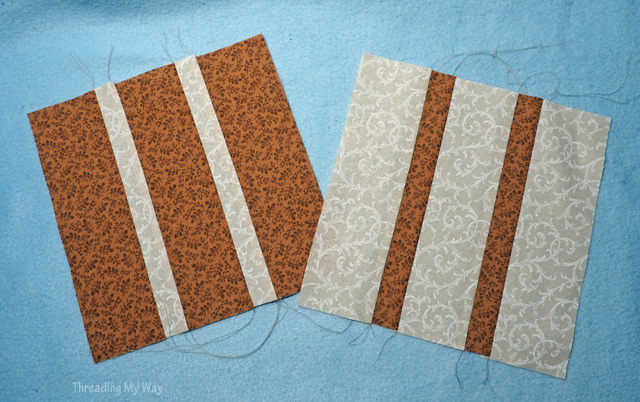 Details re making the blocks can be found in the original post - Quilt Blocks ~ Fat Quarter & Jelly Roll Friendly. 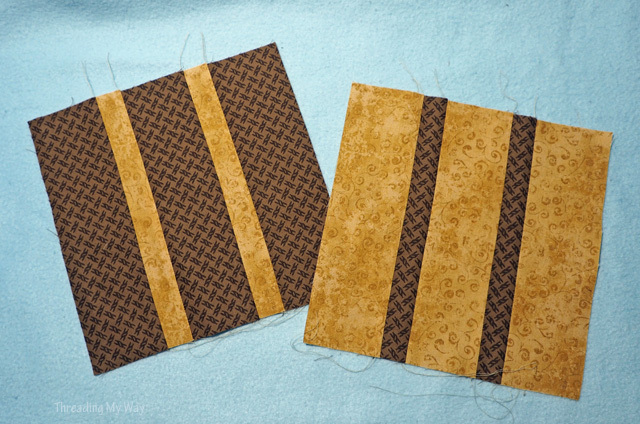 Sewing these 40 blocks hardly made a dent in my fat quarter stash, but it was feel good sewing. I felt like I achieved a lot in a short time, and that is always a positive for me. My favourites are A, B and C - the florals! I cut up a fat quarter today that I've been saving for a long time - I'm very proud of myself. Fat quarters, jellyrolls, charm squares - all are too special to be actually used - that's what my brain keeps telling me, and I find it very hard not to listen! That is a lot of blocks. I have a jelly roll that was given to me which I don't like. 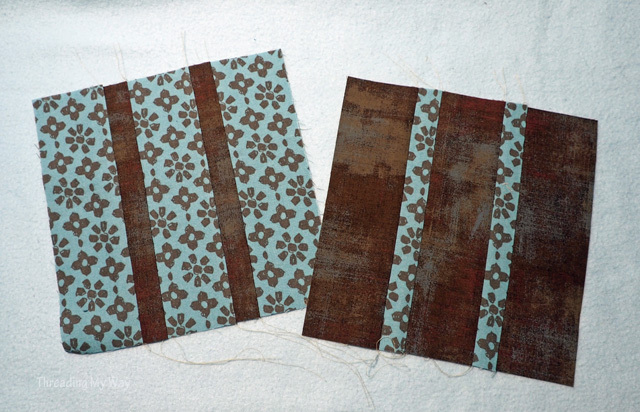 But I could put bright pop fabric in as the strips. Thanks for the inspiration.